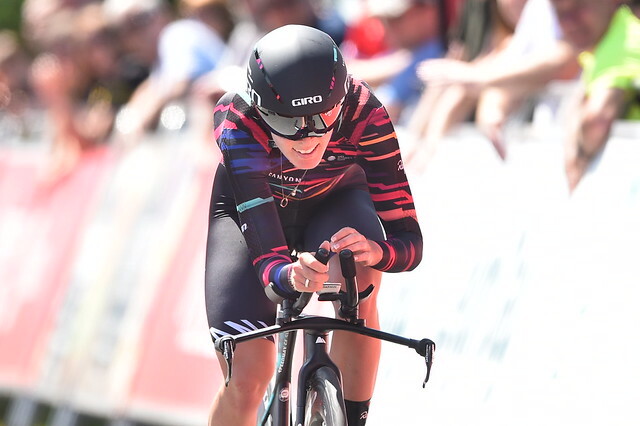 Storming rides saw Hannah Barnes and Geraint Thomas seal victories in the women's and men's time trials in the HSBC UK | National Road Championships in Northumberland, with Charlie Tanfield powering to victory in the men's U23s. Welsh rider Thomas produced a supreme effort as he raced across the line with a 37-second margin over his nearest challenger, Harry Tanfield. The Barnes siblings, the only riders on the day to go under 40 minutes over the 28.6km women's course, ensured a Canyon-SRAM Racing one-two, with Neah Evans of Storey Racing coming in third on a hot afternoon in the north east. In the men's U23 time trial, Charlie Tanfield continued his terrific year by speeding to success ahead of Charlie Quarterman, who looked set for a surprise gold until the last, while Tom Pidcock claimed bronze. Fresh from his win at the Criterium Dauphine earlier this month, Team Sky’s Thomas displayed his class and form as he crossed the line in 48:54.784, 37 seconds faster than nearest rival Tanfield (Canyon Eisberg), who became the second member of his family to finish on the podium on the day after clocking 49:31.944. Five-time champion Alex Dowsett’s ride of 49:48.805 over the 39.7km course was good enough for third, nudging John Archibald out of the medal places after the Scot had ridden superbly earlier in the competition. JLT Condor’s James Gullen finished fifth, while Thomas’s Team Sky teammates Tao Geoghagen Hart and Jonathan Dibben ended the day sixth and seventh. For double Olympic champion Thomas, the victory is the perfect result as he gears up for another assault on the upcoming Tour de France. “It’s great. Winning Dauphine was a big boost. I’ve done a good bit of training since and to come here and win the nationals for the first time is great," he said. “I’m really happy. I was confident but I really didn’t know what to expect. Obviously Tanfield has been riding really well this year and Dowsett, it’s what he does. Hannah Barnes clocked 39:38.145, 17 seconds quicker than Alice in second, while double Commonwealth medallist Evans’ effort 41.15.361 was the quickest of the rest of the field. Emma Lewis and Molly Patch, both of Fusion RT Veloperformance, rode impressively for a respective fourth and fifth, while Olympic champion Dani Rowe sealed sixth and Britain’s most decorated Paralympian, Dame Sarah Storey, finished seventh. The performance of the Barnes sisters, on a highly technical course through the resplendent Northumberland countryside, will certainly mark them as the riders to watch going into the rest of the weekend's competition. And for Barnes, silver medallist last year, the victory was sweeter after targeting time trial success at the start of the season. “It was a big target to win, I worked on my time trial a lot leading up to this," said the 25-year-old. "The team has given us the best equipment and we were doing quite a lot of aerotesting. “So for me it was a big goal, it’s down to you on the day and I tried to prepare as well as I could for it. “I knew I was first at the split but didn’t know who was second. I crossed the line and found out I was fastest, then I found out Alice was second and I was really shocked by that. “But she’s really strong and she surprises a lot of people a lot and it’s really nice to have her in second place. Canyon Eisberg’s Tanfield’s year gets better and better as he added the U23 men’s time trial title to his ever-growing cabinet of silverware. He has already claimed World and Commonwealth titles since the turn of the year, in team and individual pursuit respectively, while also claiming team pursuit silver on the Gold Coast. The 21-year-old tore around the lanes in a time of 36:01.852, ahead of surprise package Quarterman of Leopard Pro Cycling who chalked up an impressive silver in 36:29.274. Team Wiggins’ Pidcock sealed bronze in 37:23.428. Tanfield, among the pre-race favourites, finished third in the same competition last year and admitted he had ridden the course frequently in the build-up to the race, with that exhaustive preparation paying dividends. “It’s a local course for me so I’ve spent the last few weeks riding on it on most days,” he said. “I knew exactly what I wanted to do coming into it and how I wanted to ride it so it’s about executing the plan and making sure nothing went wrong on the day. “I’m really happy to have finished it off today, I had two road targets this year – the national time trial and trying to get to the worlds as well. I wanted to show everyone what I could do – it’s my last year in the U23s as well and I wanted to make the most of it. “I heard the team car behind me shouting “up, up”, and I thought Tom Baylis was catching me and it wasn’t going to plan!